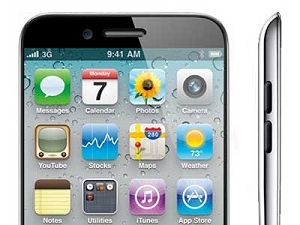 The latest reports from the rumor mill indicate that Apple’s next iPhone will ship with a 4.6-inch Retina display. If true, the sixth generation handset from Cupertino would be the first to deviate from the 3.5-inch display that first shipped with the original iPhone in 2007. Reuters was the first to deliver the rumor courtesy of the Maeil Business Newspaper out of South Korea. The newspaper claims that unnamed industry sources say that Apple has started placing orders with suppliers for the larger display. The piece noted that LG Display and Samsung Electronics, two of Apple’s major display suppliers, declined to comment on the rumor. Macrumors has weighed in on the subject, casting doubt on the validity of the claim and the source. A 4.6-inch display would be a significant increase in size, putting the phone among some of the largest on the market. Furthermore, the team notes that the rumor is coming from a Korean source with no track record of Apple rumors. Finally, the staff points to a post that first appeared on iLounge last November. In that post, an anonymous source correctly predicted that the new iPad would be a little thicker than the iPad 2. In the same post, the source said that the next generation iPhone wouldn’t feature the teardrop design that hit the rumor mill heavily last year. Instead, we can expect a 4-inch display on a phone that will be 8mm longer with a metal casing (probably aluminum) that should launch sometime this summer. Of course, that was four months ago and plans could certainly have changed since then.